Euro 2016: How have Wales fared against Group B rivals? Wales manager Chris Coleman returned from Paris pretty content with his lot after the Euro 2016 draw. A wry smile broke over his face when Wales joined England - the one team Coleman wanted to avoid - in Group B.
Russia and Slovakia - among the weakest sides on paper in their respective pots - completed Wales' group, and the general consensus was it could have been much worse for the bottom seeds. Wales have met all three opponents in recent years, so do those past meetings justify Coleman's confident prediction that his side can progress into the last 16? Head-to-head: The history book offers little comfort or cause for optimism. In 101 previous meetings, Wales have managed a paltry 14 victories compared to England's 66. After a 20-year gap of no games, the neighbours faced each other four times between 2004 and 2011, but the depressing pattern continued for Wales fans as England won them all without conceding a goal. Most recent meeting: Ashley Young's goal settled an uninspiring game at Wembley on 6 September 2011 in a Euro 2012 qualifier, a game in which Wales should have equalised but Robert Earnshaw missed an open goal from five yards. The last win for Wales came way back in 1984, where local boy Mark Hughes scored on his debut in a 1-0 win at Wrexham's Racecourse Ground. When they play: Thursday, 16 June in Lens at Stade Bollaert-Delelis (capacity 35,000). Kick-off: 14:00 BST. How they qualified: As Group E winners, England were the only nation to qualify with a 100% winning record, the first time they have done so in a European Championship qualifying campaign. A tally of 31 goals - seven from Wayne Rooney - was second only to Poland's 33. Euro pedigree: Reached the quarter-finals in 2012, losing on penalties to Italy after a 0-0 draw. Their best showing under the current format came in 1996 when, as hosts, they were beaten semi-finalists. Chris Coleman's view: "They are a great team. I have total respect for Roy and we will be up against it. Head-to-head: As Coleman suggested immediately after the draw, this game is all about "payback". Wales thought they had one foot in Portugal after returning from Moscow with a goalless draw in the first leg of the Euro 2004 play-off, but Vadim Evseev scored the winner - his only international goal - to send Russia through. Those two games were the first between both nations, and Russia won the next two, leaving Wales still searching for their first victory. Most recent meeting: A youthful Wales side lost 3-1 in a 2010 World Cup qualifier in front of a meagre 14,505 fans at the Millennium Stadium. Eight of the current squad featured in the game, including goal-scorer James Collins. How they qualified: They claimed only eight points from six games under Fabio Capello, who was sacked as a result. They won their remaining four with Leonid Slutsky at the helm, including a vital win over Sweden to pip them to automatic qualification. 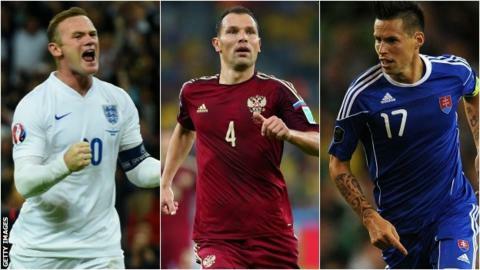 Euro pedigree: Winners as the Soviet Union in 1960, and finalists in 1964, 1972 and 1988. A run to the semi-finals in 2008 is their best performance since the fall of the Iron Curtain in 1991. Chris Coleman's view: "Offensively they are very good but at the back they do leak one or two goals. I remember that feeling well when we went out in the Euro 2004 play-off - it was horrible." Head-to-head: If past meetings are anything to go by, this match will be a cracker. Thirteen goals have been shared over two games, with both teams winning away in the Euro 2008 qualifiers. Wales were thrashed 5-1 at home in the first meeting - a match now mostly remembered for goalkeeper Paul Jones celebrating a half century of caps by shaving the figure 50 and a dragon into his hair. Gareth Bale scored the first of his 19 international goals with a sublime free-kick to give a glimpse of what was to come. Most recent meeting: Craig Bellamy stole the show in the return match to inspire Wales to a 5-2 win in Trnava. It was the first time Wales have scored five goals in an away match in 11 years. How they qualified: Won their first six qualifiers, including a 2-1 home victory against holders Spain. However, one point from their next three matches left them level on points with Ukraine before a 4-2 win over Luxembourg sealed second spot. Euro pedigree: Making their debut appearance as an independent nation. As part of Czechoslovakia, they were winners in 1976. Chris Coleman's view: "They are a good team. They play good football and are exciting on the break. They have some great results in qualifying - they beat Spain - so they'll have a lot to say in this group."